As of macOS 10.14.5 (Mojave), according to Apple, all applications have to be certified by Apple (notarization). This process checks the applications for malware and, if successful, certifies the applications. Only these “certified” applications can be installed or started. Although it will take a while until macOS 10.14.5 is available, we still have all versions now notarized by Apple. The updated versions can now be downloaded from the download page – and in the future, all new versions will be notarized. In the last few months we unfortunately had no capacity to work on finessTV because of the app development for other companies. In addition, there were various development problems with macOS 10.14, which we had to solve by bug reports to Apple – as far as we remember, there was never a macOS with so many problems from the developer’s point of view. But at least for finessTV we can finally offer an adapted version. Unfortunately for nessViewer and nessMediaCenter still not – but we assume / hope that we can also clarify the still open bug reports with Apple. ST Server 1.0.2 (Mac), Client 1.6.2 (Mac) and Stand-Alone 1.0.2 (Mac) are now adapted to macOS 10.14, so the dark mode is finally supported. In addition, we have fixed a small bug on the ST Server that might have prevented the conversion of the LiveTV stream after server start. And there is also some unpleasant news: although all software companies should have 64 bit applications by “now” (to put it mildly), Geniatech does not seem to be able to do that? Anyway, there is still only a 32 bit version of EyeTV available. Although this version of EyeTV also runs on macOS 10.14, the VLC EyeTV plugin (also 32 bit) can not be started via VLC. Which means that the ET Server is currently not compatible with macOS 10.14. We can only hope that Geniatech will soon offer a 64 bit version – it was announced a long time ago. We improved now EPG parsing for the ET Server as well: if the EPG channel info has the same name as the channel name in EyeTV, then the EPG is displayed automatically. In other words: the EPG must not be assigned to the channels in the “Channels List & EPG” window. And we tested EyeTV T2 Hybrid with the ET Server on an older iMac (2009), which does not meet the hardware requirements of Geniatech. Digital DBV-C reception is possible with this configuration, but insufficient power is available for additional applications such as the ET server. Therefore, the minimum video quality of 512 kB or 256 kB has now been improved for the ET server. Of course, the video quality on the client is very low, but e.g. for iPad or iPhone quite applicably. The basic version of the stand-alone for Mac has now past the internal alpha test and are available for beta test at the download page. The TV receiver must be Sat IP (DLNA/UPnP) compatible – like the Fritz!Box Cable Router or the FRITZ!WLAN Repeater DVB‑C. 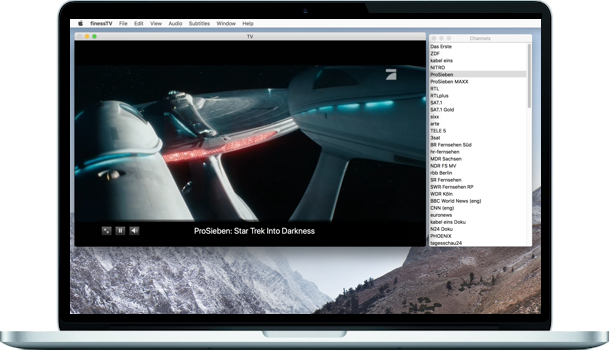 After the successful connection, the available channels are displayed in a list and the current live stream is displayed in the main window. Selecting a channel will change the channel in the main window. The channels can be resorted by drag and drop. The up and down key selects the previous or next channel. A double click in the main window toogles the fullscreen display. In the main window, a control panel will be displayed at the bottom if the mouse cursor is moved over it. The control panel allows it to pause / restart the playback, to toogle the fullscreen display and to switch the sound on / off. And if available, the current channel and program title is displayed in the middle. Furthermore the audio and subtitle track can be selected in the corresponding menues. Please note that incoming connections must be allowed in the firewall settings for finessTV. As promised some time ago, finessTV 1.6 now supports more TV receivers. There are now two server solutions: the previous server streaming EyeTV live streams (which has been renamed to “finessTV Server ET”) – and the new “finessTV Server ST”. 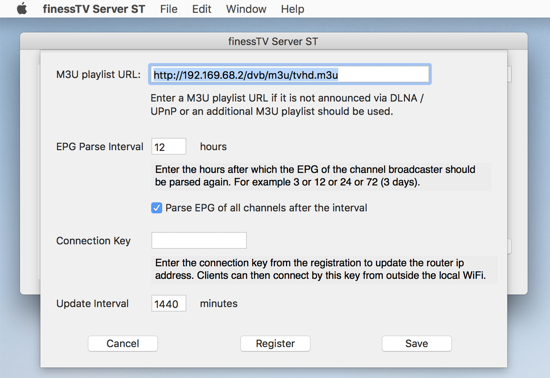 “finessTV Server ST” connects to a Sat IP compatible TV receiver like Fritz!Box Cable Router or FRITZ!WLAN Repeater DVB‑C, extracts the live channels from the M3U playlist announced via DLNA/ UPnP and starts streaming of the first channel. Alternatively / additionally, a M3U playlist URL can be specified in the preferences. This might be helpful if the Sat IP TV receiver does not announce a M3U playlist. Or if a Fritz!Box TV receiver is used and the HD channels should be available too. The channels can be resorted by drag & drop and renamed in the “Channels List & EPG” window (available in the File menu). 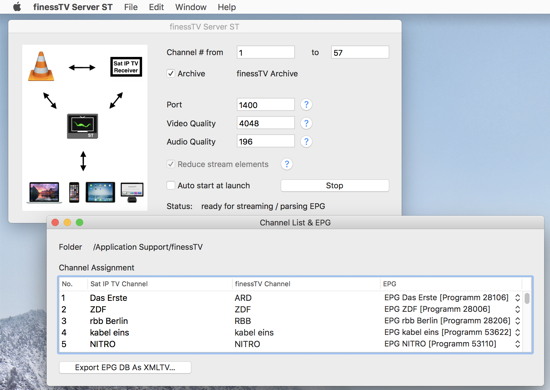 “finessTV Server ST” also supports EPG of TV providers – and we improved EPG parsing: if the EPG channel info has the same name as the channel name of the Sat IP TV receiver, then the EPG is displayed automatically. In other words: the EPG must not be assigned to the channels in the “Channels List & EPG” window. Another important highlight is recording: Fritz!Box, for example, offers only the iOS app – and can not make recordings of a live channel. In contrast, finessTV not only offers clients for AppleTV, Mac, iPhone and iPad, but also allows programming of recordings. These recordings are available in the clients if a finessTV archive has been selected in the server.